Hardwood Floor Cleaning Do’s and Don’ts. After you’ve purchased your elegant and beautiful hardwood flooring, you’ll want to be sure you’re taking exceptional care of it. Maintaining your hardwood floors will keep them looking like new for years to come, and can even improve their longevity. Cleaning your floors on a routine basis can keep them looking great, but cleaning them incorrectly can actually damage them. To be sure you’re helping, not hurting, your floors, check out the following do’s and don’ts for cleaning hardwood floors. You do want to clean your floors on a routine basis. Staying consistent with a schedule is a great way to be sure your floors are getting the attention they need. The specific cleaning routine you will need depends on the flooring you have, as well as how often dirt tends to accumulate, and if you have pets or children. 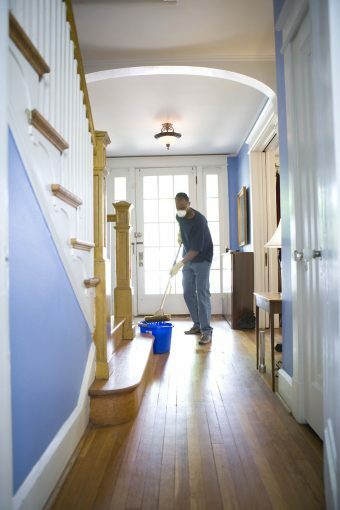 You don’t want to use a wet mop on your hardwood floors. Water actually damages flooring, so wet mops can lead to water damage, which is expensive and difficult to repair. You do want to use a vacuum or dry mop to clean your hardwood floors. These tools are the perfect way to remove dust or dirt, without leaving behind any damaging water or liquids. You don’t want to use harsh cleaners to clean your floors. While harsh cleaners may seem like a great way to aggressively attack dirt and bacteria, these cleaners will actually attack your floor’s finish, taking years off of its longevity and aging its design. You do want to use ice to remove tough substances. Yes, ice. Ice will harden these substances, like chewing gum, and make them easy to scrape from the floor, without scratching or being too aggressive during the removal process. You don’t want to use abrasive tools. Hardwood floor can be easily scratched or dulled with abrasive tools, including steel wool. Avoid these tools when cleaning to maintain the beautiful appearance of your flooring. You do want to clean up spills ASAP. Letting a spill sit on your flooring for an extended period of time will increase its ability to stain. Unflattering stains, that have seeped deep into the layers of your flooring, are unattractive and potentially damaging. To be sure this doesn’t happen, tend to a spill as soon as it happens. By following these tips and tricks, you can maintain the stunning quality and design of your hardwood flooring for years to come. If you’re interested in purchasing new hardwood flooring for your home, consider flooring.org. We supply a huge variety of attractive hardwood flooring options at affordable prices you’ll be sure to love!